Basil is also known as "Sacred Tulsi" or "Holy Basil". It is cultivated and known for around 5000 years. The tropical regions of Asia, Iran and India were the producers and consumers of basil for a long time till it became a popular herb thanks to the extremely beneficial properties of basil. While there are more than 60 varieties of basil and most of them are adaptable to organic cultivation, you can consider "Genovese" and "Italian large leaf basil" varieties relatively easy for growing. You can also choose to grow "Thai Basil" which has a mild anise flavor and is sweeter compared to the Italian variety. Purple variety of basil known as "Purple Ruffles" is also considered one of the best. Basil herb benefits body by increasing its resistance and developing strong immunity system. While many of the benefits have immediate effect and are evident clearly, some of the benefits show in long run when the body's natural process of healing and health improves gradually. This becomes obvious after taking a regular intake of Basil or "Holy Basil extract" for weeks altogether. You may feel more energized and relaxed after consuming a cup of basil tea or basil juice. Modern scientific research confirms that basil reduces stress, enhances stamina, lowers cholesterol, relieves inflammation, eliminates toxins, prevents gastric ulcer, lowers fever, improves digestion and provides a rich supply of antioxidants and other nutrients. It has traditionally been used by folks in Ayurvedic remedies and medicine in countries around the world. It is also finding wide usage in homeopathy and pharmaceuticals. The unique composition of "Basil" is highly complex with its different beneficial compounds known as phyto-chemicals, essential oils (containing linalol, estragol, eugenol, citral and citronellal monoterpenes), tannins, flavonoids, rosmarinic, caffeic and chlorogenic acids. Antioxidant - The anti-oxidative effect is mainly due to the phenolic acids, flavonoids and anthocyanins present in basil. Due to this property, it is effective in reducing blood glucose levels. Adaptogen - The adaptogenic property of basil helps the body to adapt efficiently to stress and tension. Adaptogens present in basil reduce the intensity and negative, harmful effect of the stress caused by the hectic life schedule, mental tension, emotional outbreaks, poor lifestyle habits, infection and pollution. Basil herb is commonly used fresh in cooking recipes. The aroma of the fresh leaves is simply outstanding in salads, tuna, stews and potatoes. It is advisable to add it when the dish is almost done to retain the flavor and aroma of fresh basil that does wonders to the recipe. Beware of excessive cooking, as it destroys the flavor and the essential nutrients. Fresh herb can be refrigerated in plastic bag or dried for future consumption. 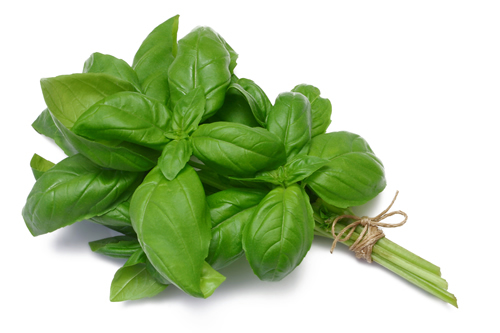 Basil is a popular and main ingredient of "Pesto" an Italian sauce along with olive oil and pine nuts. How to grow basil? Basil herbs are tender annuals in cold climate like US and Canada but are perennial in the warm, temperate and tropical regions of Asia. They can be easily grown indoors in containers or outdoors from seeds and cuttings. Growing basil indoors is simple by maintaining the soil temperature at around 70 degree Fahrenheit. Basil should be pruned when it has grown into 3 to 5 set of leaves to expedite propagation and branching. Basil is an important ingredient in potpourri and also used for scented beads. You must enjoy the delicious "Basil Herbal Tea" in the early mornings or dreary tired evenings to relish the rejuvenating experience and the fragrance that lingers for a long time. If you haven't, I would suggest you to try the aromatic "Basil Green Tea", especially with the fresh basil leaves from your herb garden. You will definitely feel the difference when compared it from the one that was obtained from the grocery stores. Drying Basil leaves and preserving it can serve you throughout the year. Sudhir Naik co-wrote the above article with Shraddha N. and has been caring for herbs for over 20 years. He is a contributing writer to http://www.evergreenherbgardens.com site - providing information and tips on herb garden. Basil's extracts are used in Ayurvedic remedies for common colds, headaches, stomach disorders, inflammation, skin disorder and malaria. Traditionally, Holy Basil or Sacred Tulsi is taken in many forms - as herbal tea, dried powder, fresh leaves or mixed with ghee. Use the fresh aromatic Basil herb in your own home herb garden, for healthy living, nature cure and rapid healing of common ailments. Sign up for a Evergreen Herb Garden Mini-Course and procure your own copy of "Secrets Of Evergreen Herb gardening" to start growing Basil indoors in your herb garden. Increase immunity and develop resistance to common allergies and live a healthy life.